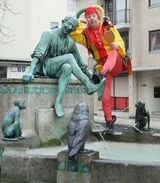 In the Middle Ages, a well-known fool with name Till Eulenspiegel lived in Northern Germany in the region around Braunschweig. A lot of stories entwine around his jokes. Here is the short version of one of them – and read, which moral I conclude from it. One day, as Till Eulenspiegel visited Braunschweig again, he was hired by a baker named Lipke who needed some help. On the second day of Till's employment, when the baker went to bed in the evening, Till asked him, what he should bake for the next day. The baker was somewhat surprised that Till asked him such a seemingly stupid question. Hadn't Till had declared himself as a journeyman baker? So, the baker answered angrily: "What do you ask me? Bake owls and monkeys (Ulen un Apen, in lower German)." And then he went to bed. Now, Till was embarrassed, too, and as was often the case, he did exactly what he was directed, namely baked owls and monkeys. On the next morning, when the baker realized what Till had done, he became furious and demanded Till to pay for the dough. "So, if I have to pay for the dough, can I have all the pieces that I baked?" asked Till. "Who needs such pastries?" the baker replied, "I do not need owls and monkeys in my shop." As it was the day before Saint Nicolas' day, when children get presents, Till took his pastries to the Saint Nicolas church. He placed himself with a basket full of pastries before the church entrance and sold all the owls and monkeys at a good profit. 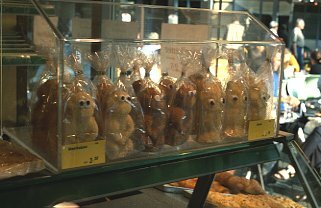 To end the story, even today you can buy owls and monkeys in Braunschweig at bakery Eckhardt. "Well, that's an interesting story," you may think (or may not...) "but what does it have to do with usability, user experience, or whatsoever?" The simple answer is that users often behave like Till Eulenspiegel: They break the rules and behave in unexpected ways. Sometimes, they take things literally, as Till Eulenspiegel did in the story above, sometimes they do just the opposite of what they are supposed to do, and sometimes they simply do something weird that no one would expect (from the users' point of view, it may not be weird at all...). "Here is my understanding of who you are, what I've learned you want or need to do, in which preferred ways and why. This is the system that I have designed for you, and this is the way you can or should use it in order to fulfill a range of purposes that fall within this vision." Here, definitely, the designer, his intentions and expectations come first. What about the richness of human behavior? What about the motives that let people behave in certain ways, such as rationally or erratically? Once again, the human aspects have been sacrificed on the altar of a formal model. In my opinion, this model carries forward the traditional assumption that users are "black boxes" without "inner life and will" that react in predictable ways to certain stimuli presented by the user interface. There are, of course, differences between usage scenarios. In some cases, assuming a rational user may be at least a good approximation of the users' behavior. Think, for example, of form filling: In a business scenario, most users will fill forms in "reasonable" ways – at least as long as they understand an application. Moreover, if they would behave erratically, they would risk to loose their jobs. On the Web, however, people may enter a lot of nonsense into forms without risking a penalty. And there may also be reasons, why they do so on intent. For example, often companies require data from users that users do not want to disclose to them. If I am forced to enter data where I do not want to, I will definitely enter nonsense (therefore, I would not put too much trust in data that are collected from Web forms...). But how might we interpret such behavior using Semiotic Engineering or the GOMS model? From the designer's point of view, asking all those questions would be legitimate – from the users' it's not. The conclusion, or "moral" that I draw from this story is that user experience people need to be "fools" who challenge software applications. Definitely, it is better to let the users perform this task on their own. But in our daily work we often have to take the users' part, and for example, demonstrate to application developers how you can misuse or misunderstand their applications (and hidden messages, intentions, or expectations...). Some people have problems with taking over the fool's role. Perhaps, they believe that they undermine their authority by exhibiting "stupid behavior" in front of the eyes of developers – personally, I don't mind. Card, S., Moran, T., & Newell, A. (1983). The Psychology of Human-Computer Interaction. Hillsdale, NJ: Lawrence Erlbaum Associates.